This is an exemplary chart from the NYT Sports page. It provides a clear, informative and exciting way to visualize how the baseball season has gone for the Mets this and last year. It's been mostly up and not much down. We can observe the more subtle differences: last season was a steady rise with only two prolonged down periods; this season's curve is driven by two up periods (including right now), outside of which the record has hovered around two levels (0, +3). 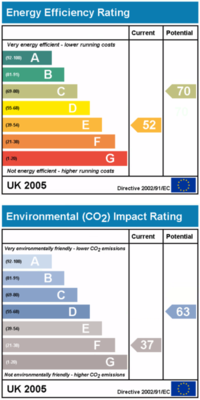 Especially commendable is the judicious use of axis labels. However, I'm not clear on how some of the labels were chosen. For example, 14 games ahead seem to me a rather arbitrary one. It's the heat of the summer so here's another entertaining contribution. Mike K, a reader, helpfully points us to this chart from The Onion (a satirical paper). The artist must know some best practices since he/she can get so many things wrong at once. At least he/she can do math, the percentages do add up to 100. Histograms are the second most popular chart, that's a surprise! Source: "America's Most Popular Charts", The Onion, Jan 7, 2007. Via Andrew, an amusing chart. At least they have the good sense of not labeling the smaller bubbles. 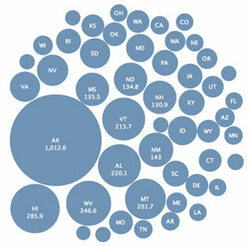 I can imagine a scatter plot with amount of earmarks against population or GDP of each state. From Mikhail Simkin comes some intriguing analysis of "experts"; in this line of research, experts are compared to the "general public" and often "proved" to be shenanigans. Stock pickers don't do better than apes; economists don't do better than Big Macs; you get the idea. In a new twist, Simkin puts twelve images of modern art on his website, and asks visitors to distinguish between those by grand masters and those "ridiculous fakes" produced by him apparently on a computer. we see that there is not much difference between the elite and the crowd. Since the shapes of the histograms are similar, one might be inclined to agree with the statement. This is until one notes the wildly different scales used because only 143 of the 56,020 quiz-takers could be identified as "elites". The shapes are clarified if we use a relative scale (percentages) rather than absolute scale. Further, the difference is more easily seen when cumulative percentages are plotted. 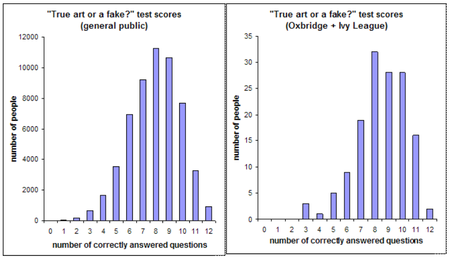 In other words, we are interested in comparing the proportion of respondents who score at least X points out of 12. A gap opens up between 4 to 7: specifically, 40% of "non-elites" scored 7 points or below while only 25% of "elites" scored 7 points or below. 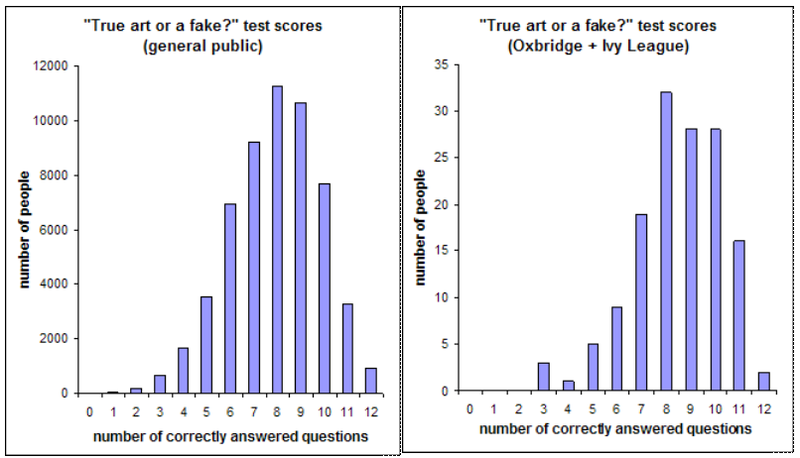 The curves criss-cross around 11 to 12: this shows that "non-elites" were more likely to have perfect scores (although this difference is small). Perhaps museum directors don't have .edu addresses. Notice that I plotted Elite vs Non-Elite rather than Elite vs All Respondents. 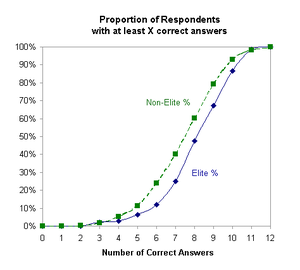 While it seems innocuous to use "All Respondents", and in this case, there is no noticeable difference since Elites were a tiny proportion, when the test group accounts for a significant proportion of the total, the value for "All Respondents" will be influenced by that for the test group. As a general rule, compare A to not A.
Simkin's exercise raises many statistical issues of design, which we won't discuss here. A couple of you noticed this table of bubbles in the Times, and asked what I think of it. Dustin J suggested that this could be considered a decent application of bubble charts. I agree, with some reservations. Which Presidential candidates are getting the most face time? Are candidates seen equally often across the stations? Are there differences between network and cable stations in terms of total face time? In terms of individual face time? Are there Democratic/Republican leanings by station? by type of station? The intrepid can even build a regression out of it. The bubble chart contains answers to all those questions but nothing jumps out. Okay, it's easy to see the station that gives each candidate the most face time. Anything else requires moderate to a lot of effort. Here's the junkart version. A heat map construct is used instead of bubbles: the legend is missing but there are four hues for each color: darkest = top 10%; medium = 10th - 50th percentile; light = bottom 50th percentile excepting zeroes; white = no face time. In raw numbers, 90th percentile = 81 minutes, 50th percentile = 19 minutes. The only data shown are the totals by candidate and totals by station. On the right margin are little bar charts that show the distribution of network/cable for each candidate. On the bottom margin are little column charts showing the distribution of party affiliation by station. Cable stations gave much more face time to the candidates in general. Fox, no surprise, gives Republicans 85% of its time while all the others were roughly equal. The more mainstream the candidate, the balanced was the time spent on networks versus cable. 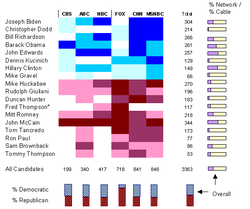 John McCain (R), Hillary Clinton (D) and John Edwards (D) had the highest proportion of network time. Source: "Tracking Face Time", New York Times, August 1, 2007.